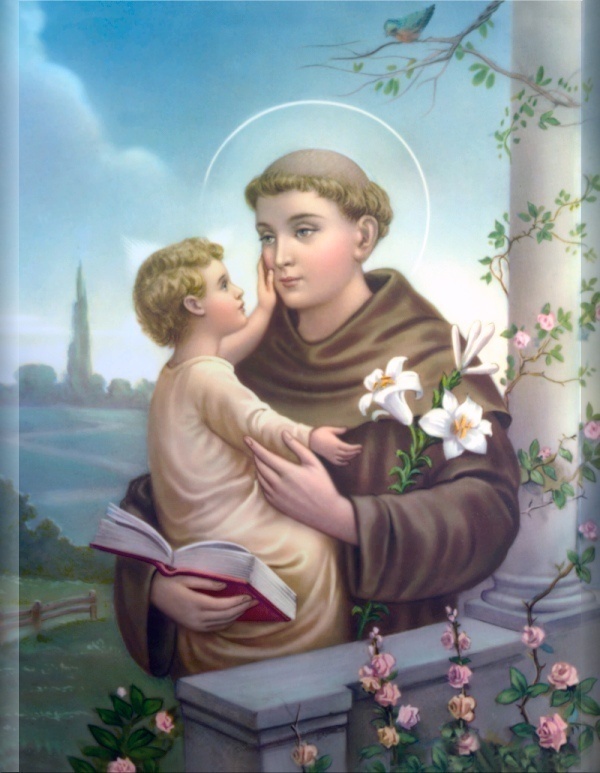 Saint Anthony of Padua, Priest and Doctor, was born in Lisbon, Portugal about the year 1195 to a very wealthy family, the son of Martin Vincente de Bulhao and Teresa Pais Taveira, who wanted him to become a noble. However, Anthony had other ambitions. Against the wishes of his family, he entered the Augustinian Abbey of St. Vincent on the outskirts of Lisbon. The Canons Regular of St. Augustine, of whom he was now a member, were known for their dedication to scholarly studies. Anthony studied Scripture and the Latin classics. During this time he was constantly visited by friends and relatives, bringing expensive gifts and news from their social world which he found very disturbing. His studies suffered and he could find no peace. He persuaded his superiors to transfer him to the Augustinian Santa Cruz Monastery (Monastery of the Holy Cross) in Coimbra, then the capital of Portugal, to continue his studies there. On one occasion when there was an ordination ceremony, many Dominican friars had been invited. It was expected that one of them - the Dominicans specialized in preaching - would give the homily but they had come unprepared, presuming that one of the Franciscans would preach. The superior felt that the only person in the community who was in any way qualified to preach was Anthony and, in spite of his objections, he was called on. To eveyone&apos;s amazement, his sermon and his insights into the Gospel made a deep impression on those present - both the quality of his voice, his learning and his eloquence. It was then that Brother Gratian, the minister provincial, sent Anthony to preach the Gospel all over Lombardy, a region of northern Italy. His skills were now widely recognized and, in addition to preaching, he taught at the universities of Montpellier and Toulouse in southern France. But it was as a preacher that he was most admired. In 1226, after attending the Franciscan chapter in Arles in France, and preaching in the French region of Provence, he returned to Italy and was sent as envoy from the Franciscan general chapter to Pope Gregory IX. At the Vatican court, his preaching was hailed as a &apos;jewel case of the Bible&apos;, and he was commissioned to prepare a collection of "Sermons for Feast Days". Anthony is buried in a chapel (once a church, now enclosed by the present building) of the large Basilica of Saint Anthony of Padua. The house where he was born in Lisbon was turned into a church, the Igreja Santo Antonio de Lisbon. He is one of the Catholic Church&apos;s most popular saints. Anthony was declared a Doctor of the Church on 16 January 1946.